I recently bought my Dyson Cyclone V10 vacuum, so you can be assured this review is real and I wasn’t even provided the product for free! 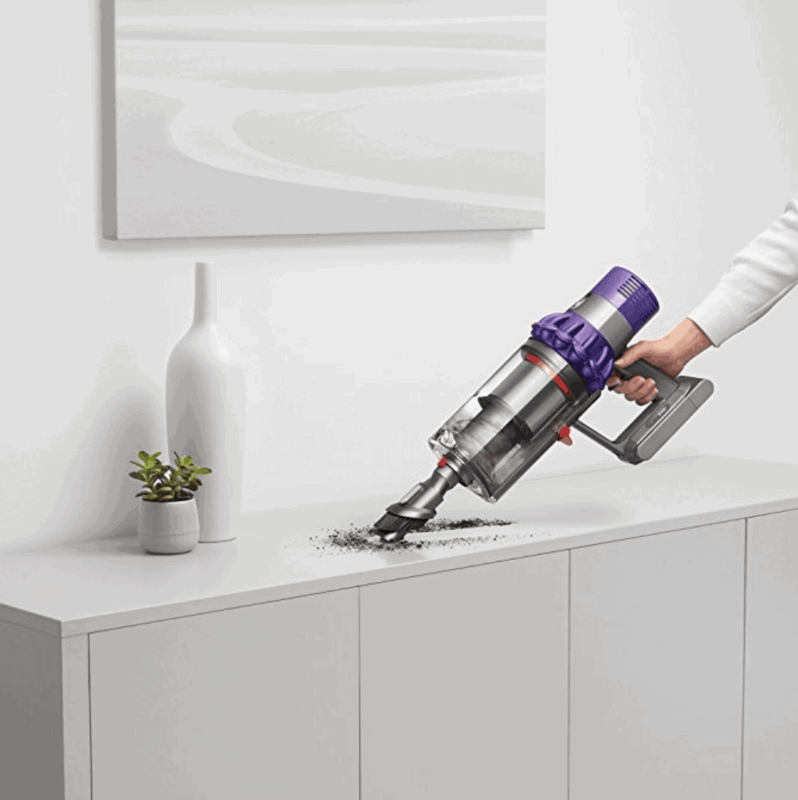 I have read some technical reviews of the vacuum, and in this review I am going to focus on a couple of issues related to the vacuum – how is the battery, and how does it perform compared to other stick vacuums and full size vacuums. I recently moved from a three level townhouse to a single family home. In my townhouse I always used a Dyson Animal vacuum on the carpets, and a broom and my hoover stick on the main level hardwood floors. My new house is set up similarly in that the main floor is hardwoods, and the basement and top floor are carpets. One thing I hated in my townhouse was lugging the big vacuum from the first level to the third to vacuum carpets. As a mom of three I am willing to spend money to simplify cleaning. I cannot afford a maid service so I am willing to spend a little more on my cleaning supplies. While I thought my Hoover stick did a great job in my old house, and I even reviewed it here, I was a bit worried about it hurting my new engineered hardwood in the new house. The engineered wood seems more likely to splinter and the roller bar on the Hoover can be hard to clean, trapping debris and possibly hurting the floor. So, I convinced my husband we needed to try a Dyson. I have always wanted one but could not justify the cost. I was going to purchase the Dyson V8 which a friend of mine has and likes, but right around that time the V10 came out. The thought of more battery life was appealing to me so I went for it. I purchased the Dyson V10 Animal edition. I truly wanted to spend the least possible so I almost got the Dyson Motorhead which starts at the lowest price for the V10, but when comparing features I realized this one had a smaller collection bin and a different motorhead. I went for the Animal version because it has the bigger bin and a better motorhead. I don’t believe I really need the fluffy roller head (the only addition on the Absolute version) and I can always purchase the fluffy roller head later. Once my Dyson arrived it was super easy to put together. I had it together and vacuuming within minutes. It comes with a few different attachments and a charging dock you can hang on the wall. This is my first Dyson stick and I wasn’t sure what to expect. I have seen comments online claiming the battery life is not that great and wishing you could exchange batteries while one is charging. Look, an extra battery would be nice but I can tell you I have been vacuuming my entire 3000 square foot house for a couple of months now and have not lost battery life once. Now I do hang it to charge after I use it every single time. Dyson claims the battery lasts 60 minutes and I have heard this is not entirely accurate. There are three settings to vacuum, a light one, medium, and max. I have also heard that on max the battery will only last six minutes. I have not entirely tested this but I do use max on carpets and again have never lost the battery life. There is also an indicator on the handle which lets you know how much battery life you have left. So while I read a lot of reviews discussing the battery life not being that great, I think it is fine! More than fine actually because I have never had it die on me yet. I think these reviews are either coming from people who are not used to cordless vacuums or people who are using it on max the entire time. How much time do you typically spend vacuuming? That’s something to keep in mind when considering the battery life. I mainly use mine for quick cleanups and occasionally will do an entire floor or two and my battery lasts for me. My other two vacuums are the Hoover Linx Stick and the Dyson full size Animal vacuum. While I did not expect the Dyson v10 to compare to my full size vacuum I feel it has actually replaced it. I have used my corded full size vacuum only a couple of times since moving into my house and buying the V10 almost four months ago. On the max setting my V10 is as strong as the corded vacuum. And, while the max setting is the one that drains the battery the quickest I still have not had an issue vacuuming all my carpets upstairs. The other light and medium settings are more than enough for hard floors. And, sadly my Hoover Linx is getting no use these days. The Dyson does a better job for me and also can be used as a handheld which is something the Hoover does not have. 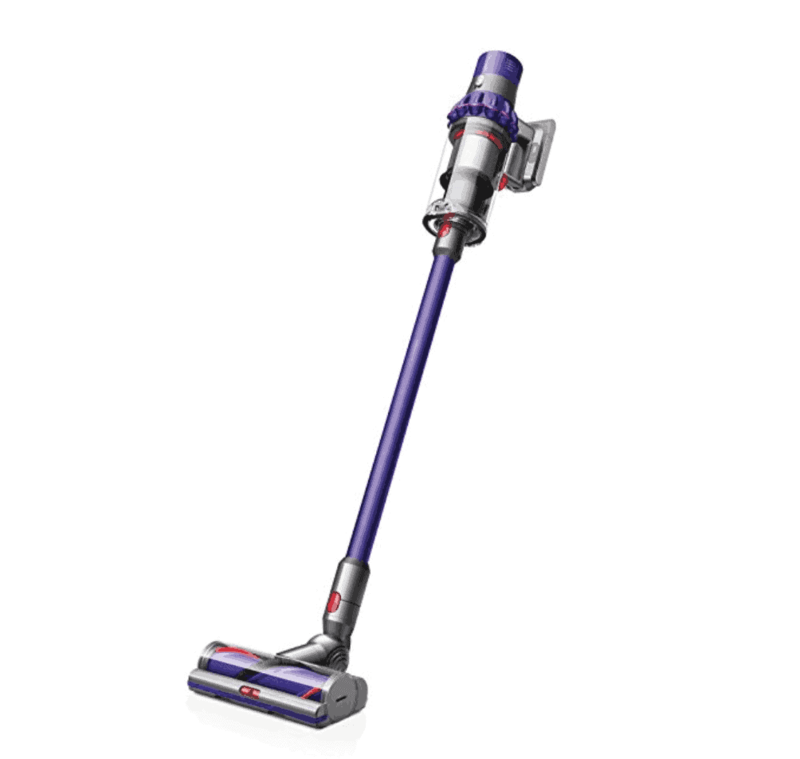 I think the Dyson Cyclone V10 Animal Lightweight Cordless Stick Vacuum is worth every penny for me. I spent years talking myself out of one but now that I have it I am not going back. In fact this is probably the only vacuum I need. If I had to pick any negatives to this vacuum it would only be that the animal version and absolute version are a little big to hold with their bigger collection bins. It can feel a bit awkward at times but that’s definitely not an issue for me. Other than this, I really cannot find any complaints. 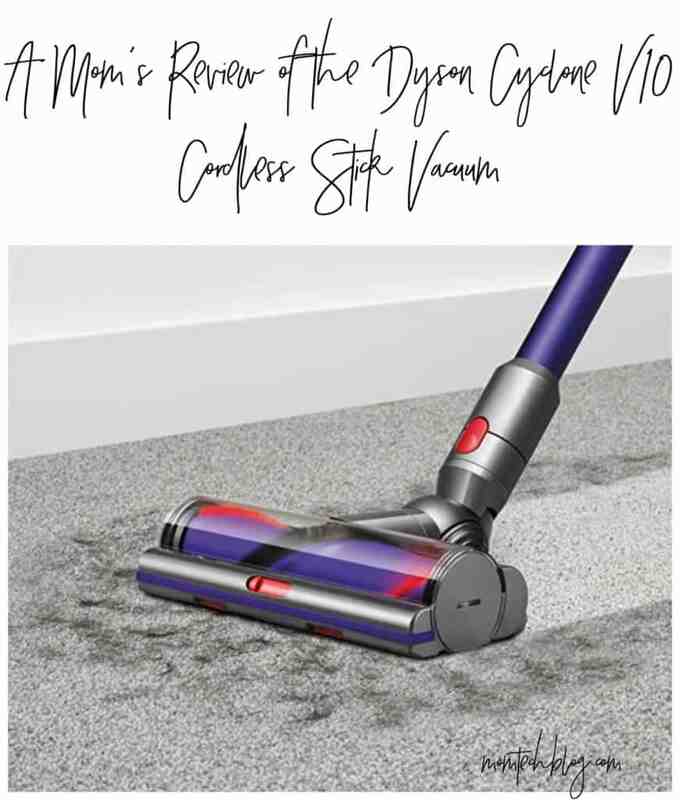 Please let me know if you have any questions about the Dyson Cyclone V10 Cordless Stick Vacuum and find it here! I have the V8 and it’s changed how I view vacuuming! I love being able to run around the house without having to deal with cords and I find it does a fantastic job cleaning. We have a Golden Retriever, and it’s so much easier to keep the house clean with a toddler on the loose. I haven’t had any issues with the battery either and have found that because it’s easy to use, I do short bursts and recharge more frequently.